A CRUISE SHIP with more than 1,000 people on board is without power in the Indian Ocean following a fire on board. The ship is part of the same fleet as the Costa Concordia which capsized off the Italian cost in January, killing 32 people. The Costa Allegra is reported to be adrift in the dark more than 200 miles southwest of the popular tourist destination the Seychelles in the Indian Ocean. Rescue vessels and tugs are heading for the cruise ship which is 20 miles from Alphonse Island, according to the Guardian. Italian Coast Guard Commander Cosimo Nicastro told SkyTG24 TV that the ship’s captain told Italian authorities the fire broke out in the ship’s engine room but that the fire was quickly extinguished. “The passengers are fine,” Nicastro said. But the fire left the cruise liner “without propulsion,” meaning the ship, with 636 passengers and 413 crew members on board, was adrift in the sea because the engines weren’t working. “The fire danger is over,” he added. Costa Crociere, the company which operates the ship, said in a statement that after the fire began in the Costa Allegra’s electric generator room, firefighting units intervened to extinguish it. “The fire did not spread to any other area of the ship. There were no injuries or casualties,” the statement said. It added that a general emergency alarm was “promptly sounded” as a precaution, and that all passengers and crew not involved in the emergency reach muster stations. There are no electric lights on board the ship and batteries are being used to keep essential machinery going. The ship is likely to be towed to a Seychelles port, BBC News reports. The Costa Allegra had left northern Madagascar, off Africa’s southeast coast, on Saturday and was cruising toward the port of Victoria, Seychelles’ capital, when the fire erupted. The Allegra had been due in Victoria on Tuesday. Built in Italian shipyards in 1992, the ship is 188 metres (615-feet) long, has eight passenger decks and 399 cabins. Its cousin ship, the Costa Concordia struck a reef off a small Tuscan island on 13 January, listing drastically to one side and forcing an eventual evacuation of the entire ship. In total 25 people were confirmed to have died while seven people are still missing as a result of the incident. The ship’s captain was later arrested amid allegations that he abandoned the ship long before everyone had been evacuated. Several other officials were placed under investigation by authorities in Italy. Concordia passengers have said that the order to evacuate came about an hour after the ship was speared by the reef and started taking on water. 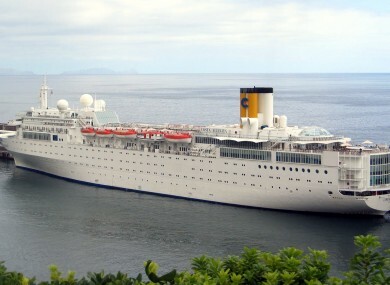 Email “Costa cruise ship adrift off the Seychelles in the Indian Ocean ”. Feedback on “Costa cruise ship adrift off the Seychelles in the Indian Ocean ”.